That’s what makes Leigh’s latest effort such an anomaly. 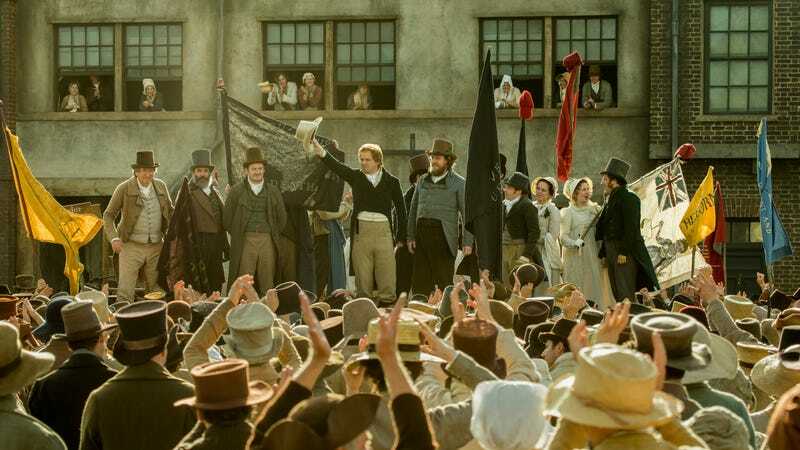 Peterloo doesn’t deliberately skimp on character, but it’s the first of his movies in which no individual makes much of an impression, and each one is fundamentally subordinate to the larger event being painstakingly chronicled. 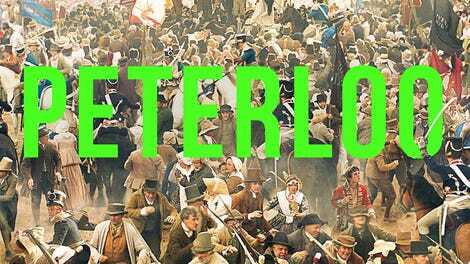 “Peterloo” is the nickname given to a massacre of unarmed civilians by cavalry soldiers that occurred on August 16, 1819, at St. Peter’s Field in Manchester. (Just as we now strip the “Water” from Watergate for every similar scandal, they stripped the “Water” from Waterloo, suggesting an equivalent to Napoleon’s then-recent bloody defeat.) Eigtheen people were killed in the melee, with hundreds more injured; the movie builds to the horror, eventually showing just what happens when men on horseback charge into a crowd with their swords drawn and start indiscriminately slashing at people who are just trying to get out of the way. To his credit, Leigh is less interested in the massacre itself than he is in the series of political machinations that inexorably led to it. His challenge: That’s an incredibly dry subject—England’s equivalent of Ben Stein droning on to Ferris Bueller’s classmates about the Smoot-Hawley Tariff Act. Here, the proximate cause of all the trouble is tariffs imposed on imported grain, known as the Corn Laws; widespread dissatisfaction with these laws, which benefited wealthy landowners at the expense of everyone else, resulted in demands for parliamentary reform. Peterloo makes an effort to demonstrate how this affected a typical Manchester family, opening with one weary soldier (David Moorst) returning home from Waterloo and subsequently becoming semi-radicalized as a result of the deprivation. Mostly, though, the film consists of public meetings at which organizers bellow things like “The object of Parliament ought to be the general good, the equal protection, the security of the person and property of each individual, and therefore labor—the poor man’s only property—ought to be as sacred as any other property!” That sort of rhetoric almost always gets exhausting in a hurry (even MAGA-heads who wait in line all day to see Trump free-associate often leave early), and it represents a sizable chunk of this lengthy film’s first hour. Peterloo does get progressively more compelling as it goes. Leigh hasn’t lost his knack for finding first-rate but relatively little-known actors, and there’s a sudden influx of charisma when Neil Bell shows up as Samuel Bamford, the radical reformer (that’s his Wikipedia description!) who invites renowned orator Henry Hunt (Rory Kinnear) to deliver an address at St. Peter’s Field. (Spoiler alert: It does not go well.) Leigh being Leigh, there are also brief but well-researched digressions into such niceties as 19th-century printing methods—you truly feel the era in his period films, via art direction that reflects now-antiquated ways of life in background details. It would be hard to demand a more scrupulously accurate movie about the Peterloo Massacre, or even to suggest a superior approach to the subject that Leigh or someone else might have taken. But there’s a reason why people poke fun at the opening crawls in the Star Wars prequel trilogy, with their soporific references to “the taxation of trade routes to outlying star systems” and “unrest in the Galactic Senate.” It’s the same reason why there are few movies about the American Revolutionary War, which was likewise spurred by matters of taxation and equal representation. Some things, no matter how important, are just kinda dull.